One day in mid 1981 while contemplating the fact that the Navy was finally getting into the lo-vis business, (why they didn’t think of lo-vis while flying airplanes with gloss white bottoms, black noses, and some of the most colorful paint schemes ever applied to Naval aircraft into the most intense air defenses in the history of air warfare over a country that was mostly green and brown, I’ll never know). I thought, "if they’re using the A-4 to simulate the –17, why not try to make the A-4 look like a MiG? So I built a Hasegawa 1/72 Scooter, found some 1/72 drawings of a –17, cut them out with blunt scissors and traced the outline onto the A-4. 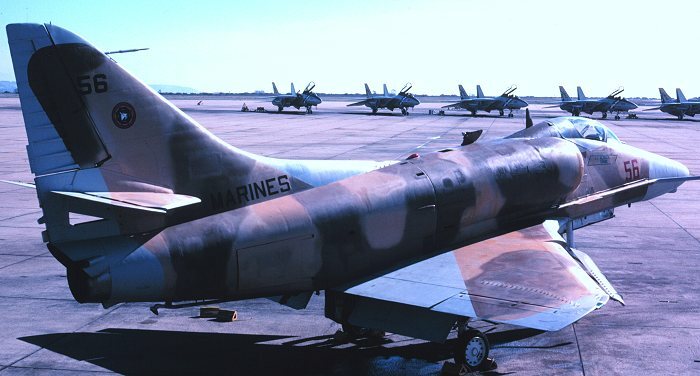 The only part that was a problem were the wings, the A-4 has a 27’ wingspan and the –17 has a 37’ span. I adapted the outline and brush painted the model. I used Pactra Flat Roof Brown for the dark brown and added white for the tan. I don’t recall what gray I used on the bottom. When done, I added a two foot stick to the bottom of the model and it really looked bitchen’. I could play with it and admire my work at the same time! In order to get the design in front of the right people I called my friend, Then COMFIT at Miramar, RADM Paul "Gator" Gillcrist, F-8 driver extraordinaire. Paul is a real fighter guy and loves anything to do with tactics, camouflage and anything that’ll give our guys an advantage. Anyway, in his office, I explained my thinking to him, he picked up the phone, called Lonny Mc Clung, then skipper of Top Gun and said he was sending a guy, (me) over with a model of so and so and to paint one of his airplanes just like it. I took the model to Top Gun, Explained the idea to 3 or 4 pilots and they said, "Great, we’ll try it!!!!". It was that easy. Anyway, the fact it was done so quickly is the result of creative thinking, no red tape and an Admiral that was/is a fighter pilot first and doesn’t see the need to shuffle paper. According to pilots that evaluated the scheme, it worked well inside of a quarter mile, outside of that, it seemed to just be another airplane. The main change NFWS made to the scheme was to continue the color over the top of the fuselage, other than that, it was applied just as yours truly designed it. I don’t know how long the scheme was on the airplane because at that time all the adversary squadrons were trying many different things, the only thing constant was change. At one time VA-127 had a –17 on a TA-4 and some adversary groups have painted their F-18s to look like Flankers and/or ’29s but I think the –17 on Top Gun's A-4E was the first of the bunch. I later tried to do the same thing with a –21 on an F-5 but it didn’t work and I never took it to Top Gun. Later, I tried to get the model from Top Gun but by then it had suffered a too low scoop out with one of the class room tables and was assigned to the dead model file, (trash). All images Copyright Mike Wilson and cannot be used without permission.